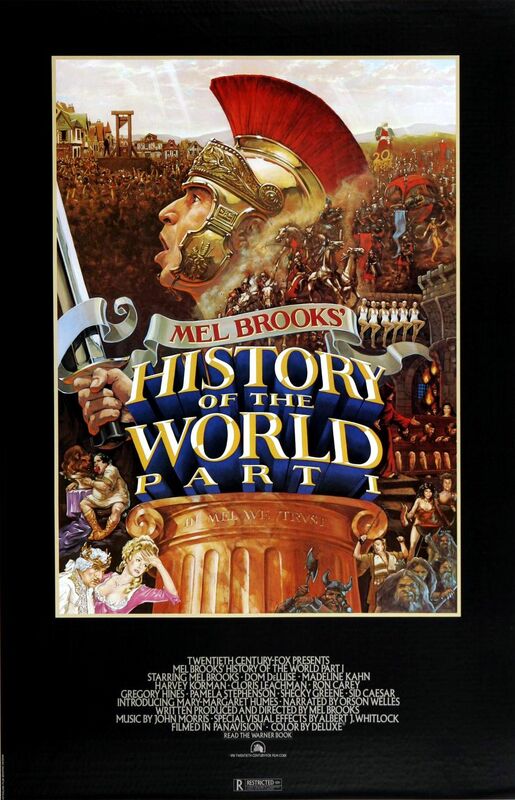 What It’s About: Mel Brooks spoofs pompous historical epics by giving us a short history of the world, including segments set in Prehistory, Biblical Times, the Roman Empire, The Inquisition, and the French Revolution. Why Watch it Today? : Writer/Director/star Mel Brooks was born today in 1926. History of the World Part 1 is arguably his last great movie as a director (though Spaceballs and Robin Hood: Men in Tights have their defenders) and is certainly the last in his parodies of Golden Age Hollywood that began with Blazing Saddles. This entry was posted in Anthology, Biblical Epic, Comedy, Epic, Event Film, Independent, Movie of the Day, Musical, Period Film, Slapstick, Spoof and tagged Barry Levinson, Bea Arthur, Brooksfilm, cameos, cavemen, Cloris Leachman, Dom DeLuise, France, French Revolution, Gregory Hines, Harvey Korman, Henny Youngman, Hugh Hefner, Jack Riley, Jackie Mason, John Hurt, Madeline Kahn, Mel Brooks, Moses, Orson Welles, Rome, Ron Carey, Shecky Greene, Sid Caesar, The Inquisition.